Whether your car is old or new, you should take car care seriously. Your maintenance decisions could impact how many more years your car will last – and how efficiently it performs every time you drive it. Follow these tips to help ensure your car remains reliable for years to come. If you’re not sure how to do some of the tasks listed here, bring your car to Scott’s Fort Collins Auto & Repair for affordable, reliable car care. The old rule of thumb – which states you should have your oil changed every three months or 3,000 miles – doesn’t apply to many new cars. Better oils and more advanced engines can run on the same oil for longer. Check your vehicle’s owner’s manual to see how often the manufacturer recommends an oil change, as well as the type of oil you should use. Scott’s can handle all your oil change needs and make the chore as painless as possible. Check fluid levels often. 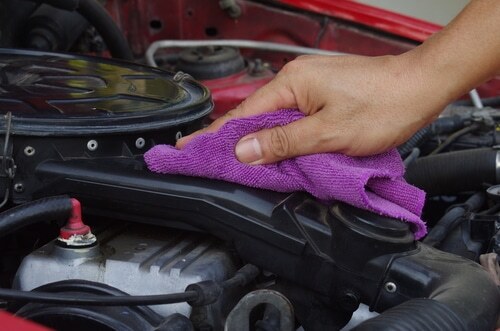 Periodically check the air filter as well and change it when it appears dirty. Look for cracks in engine belts and radiator hoses. A good time to make these inspections is during an oil change. Check that battery cable connections are tight with no corrosion. To remove corrosion, scrub the terminals with an old toothbrush dipped in a water-and-baking paste. Bring your car to Scott’s for a free battery test any time. We can recharge or replace your battery as needed. Check your tires once a month to make sure they’re inflated to the level recommended by the car’s manufacturer. This reduces wear and tear and improves gas mileage. Then, rotate your tires every 7,500 to 10,000 miles to add up to 10,000 miles to the life of your tires. When you bring your car to Scott’s for an oil change, we can rotate your tires and ensure proper wheel alignment for optimal safety and tire performance. Coolant, or antifreeze, serves the dual purpose of keeping the engine cool in the summer and helping it warm up in the winter. This means you need to maintain system coolant all year round. Scott’s can perform cooling system maintenance and repairs when you need them. Keep an eye out for windshield dings. If a rock chips the window, have it repaired quickly to prevent it from turning into a large crack. Seek windshield chip repair especially quickly in the winter, since the thermal shock of a warm interior against the cold glass is likely to cause a chip to turn into a crack. If your wipers start to skip or chatter across the windshield, have them replaced promptly. For your safety, it’s vital to have working wipers when it rains and snows. With our snowy Northern Colorado climate, consider installing winter wiper blades that feature a protective rubber boot over the frame so snow doesn’t become lodged inside. When the temperature drops each fall, consider switching to winter tires and special oils and fluids recommended for winter use. Fall is also a great time to have your battery checked, since cold temperatures can be too much for a weak battery. At Scott’s, we can hook you up with everything you need. Clearly, regular car maintenance – not just repairs when something goes wrong – is important to keep your vehicle in good shape for years to come. Stop in at Scott’s Fort Collins Auto & Repair today for an oil change, tune-up, tire rotation or any other services you need. You can also schedule an appointment online or call ahead at (970) 682-4202.